Meant to serve the Reading area with a connection to the Pennsylvania Turnpike, work commenced on the Morgantown Expressway in 1961. One of the driving forces behind construction of an Interstate connection was that, at the time, Reading was center of the bustling coal industry. The first section from Exit 7 to Exit 11 opened in 1962 and the remainder of the expressway from PA 10/PA 23 to Exit 7 opened a year later as Interstate 180. With the introduction of Interstate 76 in 1963, the designation was changed to the current Interstate 176. The first exit numbers appear on the Interstate in 1975 were mileage-based and lasted until 1978. They would not reappear until 2001 when Pennsylvania switched all Interstates to mileage-based exit numbers. 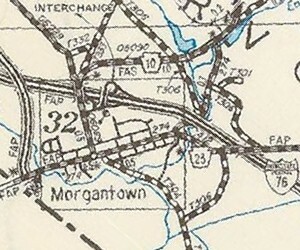 One problem with the original alignment of the Morgantown Expressway was that it did not connect directly to the Turnpike, but rather ended at a traffic light much like as Interstate 70 does in Breezewood. 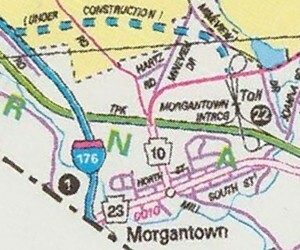 Just as in the "Town of Motels," traffic had to use an at-grade route, PA 10 and PA 23, through Morgantown to travel between the two limited-access highways. I remember negotiating that route to make the connection in August 1990 just before the new junction opened. Work to rectify this situation began on February 28, 1989 when the Pennsylvania Turnpike Commission broke ground for the new Morgantown Interchange, just east of the original which was located where PA 10 crosses the Turnpike. The new interchange opened to traffic on September 18, 1990 with provisions for connection to a new expressway alignment to the north. Construction on that new alignment between the Morgantown Interchange and original Interstate 176 alignment at what is now Exit 2 began in 1993. The new mile-long section of the Morgantown Expressway opened in 1997 and became the new route of Interstate 176, which after 34 years now finally ended at its parent route, Interstate 76. 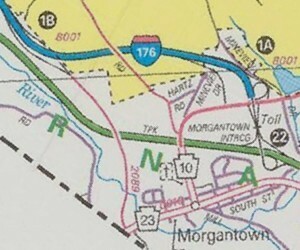 The old portion that was bypassed was retained as a ramp into Morgantown and received the SR 2089 designation. It takes a really big snow storm to close roads and that is exactly what hit on February 9, 2010. Governor Rendell took proactive measures and closed I-176 at 2:00 PM the following day. In a press release he stated, "For your safety, do not drive. You will risk your life and, potentially, the lives of others if you get stuck on highways or any road. The National Weather Service issued blizzard warnings for several counties in Pennsylvania and visibility is at or near zero." The Morgantown Expressway reopened at 5 AM on February 11. Page updated August 31, 2013. Information courtesy of the Pennsylvania Department of Transportation, the Pennsylvania Turnpike Commission, the Easton Express-Times.